So it’s raining, and you’ve got a bored pooch on your hands. Sure, it’s easy to have fun when you can go outside and run around or go for a walk and meet new pups, but when you’re stuck inside, things can get a little dull. Don’t worry, though. There are plenty of exciting things to learn and games to play that will keep your dog’s brain working and sharp. Here are some great indoor activities for a rainy day that will keep your dog mentally stimulated. Hide and seek is a fun game to play that will allow your dog to use their super sniffer and their hunting and tracking instincts. Start out easy by letting your pup see you hide some food around the room, then let them find it. Once they understand the game, have them wait in the other room while you hide the food. Eventually, you can replace the food with a favorite toy, or even hide yourself and have your pup come find you. This will keep your dog engaged and give them a nice reward for using their brain. Tug-of-war is an easy enough game to play indoors, but it’s also a great teaching tool. 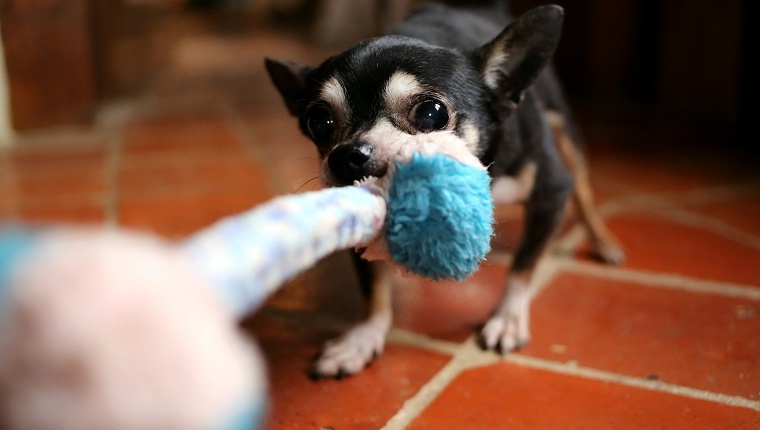 It’s a chance for your dog to learn what is a toy and what is not a toy, and it’s an opportunity for you to teach your dog how to keep playful energy in check. Just make sure that you’re the one to initiate the game and that you maintain control. If your dog puts their teeth on you or takes the toy without permission, stop the game for a bit. Eventually your dog will start learning the game and learning what is acceptable play behavior. You can learn more about how to properly play tug-of-war as a teaching tool here. A rainy day is a great time to learn some new tricks or to brush up on the basics. Learning the basic commands will help your dog with obedience and will build the bond that you and your pup share. It’s also a mental workout for your dog that will keep their brain busy. Start with the obvious ones like sit, stay, and come. Then you can gradually move on to harder tricks like shake or roll over. Before you know it, your pup will be jumping through hoops. Just be sure to mix it up and keep learning new things to keep your dog sharp. Remember that even old dogs can–and should–learn new tricks. An indoor obstacle course is a blast for you and your dog. Start simple with one piece of furniture and teach your dog to go over or under it. Be sure to give plenty of praise and rewards for each step. Once your dog has mastered one piece of furniture, you can step it up with another, or add blankets, pillows, and other objects. Get creative and channel your inner child that used to make pillow forts all the time. 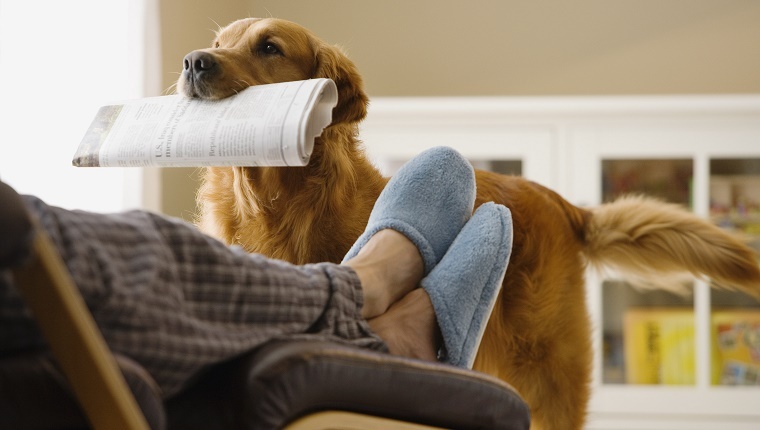 Eventually your dog will have the full routine down and get a great mental and physical workout. Your dog probably loves to play fetch with a ball or toy, but you can also use the game of fetch in different ways that will keep your dog thinking. You can train your dog to fetch their leash or your slippers, or they can bring toys to you for clean up, for example. You can even teach your pup to fetch specific toys by name and increase your dog’s vocabulary of human words. This is another chance for you to get creative, and your pup will appreciate the added mental challenge. 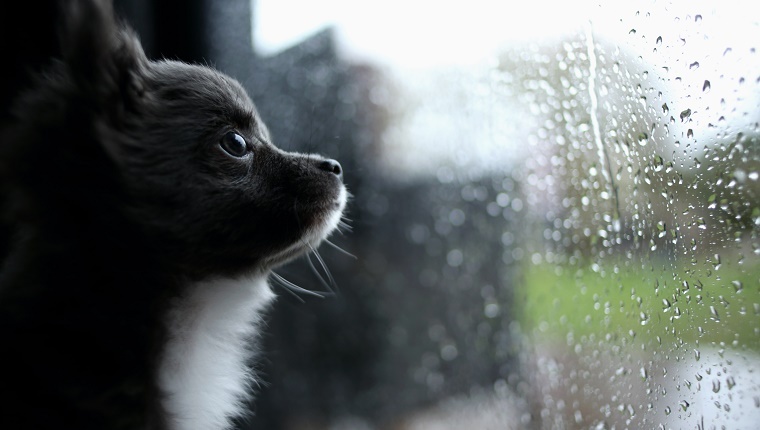 What do you do to keep your dog mentally stimulated on a rainy day? Let us know in the comments below!